Nicole Beutler’s Dido Dido with the experimental opera company Silbersee and co-producers the Ulrike Quade Company proves emphatically that a little can go a very long way. Using only Henry Purcell’s twenty-nine word, two stanza aria from his opera Dido and Aeneas, repeated in various forms ad infinitum, the ensemble weaves a mesmerizing web of intricate and complex patterns. 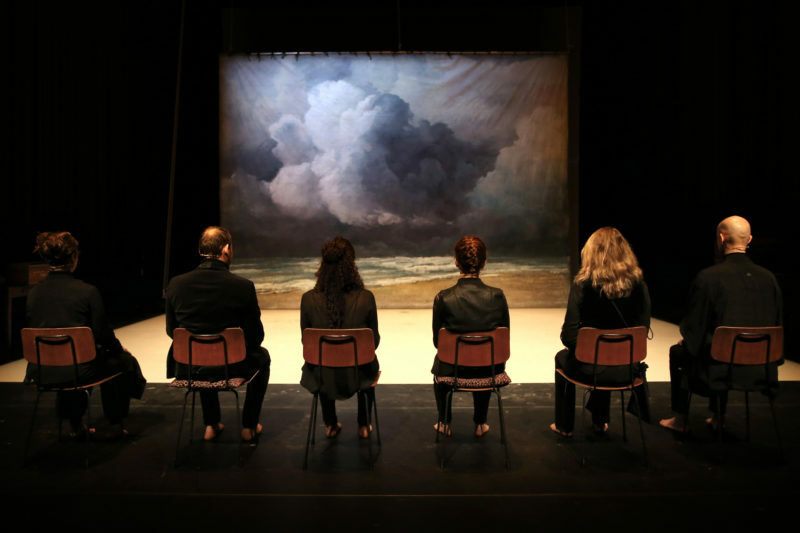 The piece starts quietly enough with six performers on a row of chairs contemplating, along with the audience, a nicely painted backcloth of a seascape with towering, majestic clouds. We are woken from our reverie as the cloth comes crashing down to the sand covered stage. The chairs are rearranged in a neat line, facing the audience and the cycle begins. With each performer speaking one word, then a phrase, the full text gradually take shape as the repetition becomes a swaying hypnotic frenzy and the group seems to enter a trance-like state. One of the women, unable to contain herself, grabs a microphone on a stand and, like demented Janis Joplin, continues screaming the words over and over again. Other elements are introduced – a simple reed flute, a tiny stringed instrument played with a bow, a small Indian harmonium and, finally, a full-size ancient carved-oak harmonium. We then meet Queen Dido herself, a beautifully manipulated Banraku puppet, who sweeps in and out of the action until meeting her sad fate. Things at this point begin to normalise a little with the complete aria finally being sung, in five-part harmony a cappella, with the performers standing in a simple straight line facing the audience with the lifeless, crumpled Dido at their feet.